This plant has been renamed – it was originally Eriostemon myoporoides. Philotheca myoporoides is a widely occurring plant found up and down the east coast of Australia from Victoria to Queensland and inland along the ranges. They grow in open forests in sheltered slopes and valleys as an understory plant. 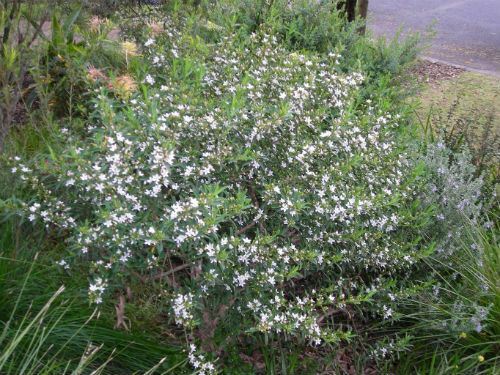 I planted my first plant over 25 years ago in my garden, in the northern Sydney suburb of Westleigh and it is still growing and flowering well. This original plant is now known as the long leaf wax flower. The leaves are up to10cm long and dotted with oil glands. In late winter to early spring, these shrubs are covered in a combination of pink buds and white flowers, all very attractive. I have planted many Philotheca as I find them to be a hardy reliable plant that will grow happily in dappled light. Once established the plant can withstand extended dry periods and is tolerant of at least moderate frosts. They will eventually grow to two metres high, although my plants do not get that high as I give them a good prune after flowering. The plant is usually pest free but can sometimes be affected by scale and sooty mould if grown in a very shady situation. One very good form of this plant is Philotheca myoporoides ‘Profusion’. It has been around for many years and I find it very hardy as well. It has much smaller leaves and this allows the flowers to be shown at their best. 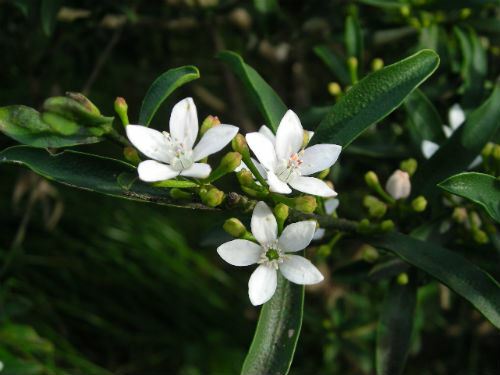 Being from the Rutaceae family, like lemons or boronias, Philotheca foliage has glands that emit a citrusy scent when touched. This makes them particularly attractive as a cut flower. Philotheca; philos - loving; theke-a covering or box, probably referring to the seed capsule. Eriostemon; from the Greek erion meaning wool and stemon meaning stamen.